The year was 1900 when Alexander Qualls brought a farm of several hundred acres from A.H. Roberts, a man who later became governor of the State of Tennessee. The farm continues to remain in the Qualls family today. It’s located in a very scenic area of Overton County on Highway 52 just outside the Livingston city limits. Alexander was the husband of Adelia Bilbrey Qualls. Together, they raised a family of eleven children. One of Alexander and Adelia’s sons, Luther Qualls, was married to Eura Owens Qualls. They had three sons, Bradley, Edward, and Gentry, and one daughter, named Jessie. It was in the State of Kentucky that Ed Brown and wife Anna Franklin Brown lived prior to moving to the Wilder community of Overton County. Their family consisted of four little girls whose names were Ester, Edith, Talmadge, and Ethel. When Ethel, the baby girl of the family, was only 8 months old, a flu epidemic stuck this area claiming the life of Anna Franklin Brown. The year was 1919. To help with the raising of those four little girls, Anna’s mother moved in with her son-in-law. After the death of Anna Brown, the family moved from Wilder to a home on Oak Street in Livingston. Ed Brown eventually married again, this time to Lottie Evans. They had one son, Bill Brown. In her later years, Talmadge recorded many wonderful details of what life was like growing up in a coal mining town like Wilder. Both Gail and Carolyn have copies of her writings about those days. Even though life was quite different in Livingston, Talmadge adapted really well. She was always an excellent student and graduated at the top of her 1935 graduating class of Livingston Academy as Valedictorian. After high school, she got a job as a waitress in Rose’s Café on the corner of the square in Livingston. At the same time Talmadge worked at Rose’s, Gentry Qualls just happened to have a job in the adjoining Sinclair service station. They began a four year courtship, and started saving their money with the plan of getting married when they had accumulated enough to begin their life together. During their courtship, Talmadge got another job working in Dr. Dowell’s dentist office for $10.00 a month. In the winter months, she always arrived around an hour early in order to carry in coal from the coal pile in the alley behind the building that housed Dr. Dowell’s upstairs office. She always had a good warm fire going before patients of Dr. Dowell started to arrive. In 1938, Talmadge and Gentry were married, and for a time, they lived with his parents. Their first home was one they rented on East Main Street where their older daughter, Gail, who was delivered by Dr. H.B. Nevans, was born. While Gail was still a baby, the Qualls family moved Crossville where Gentry was a co-owner and operator of a service station, but they didn’t really like it there, so they decided to move back to Livingston. This time they moved to the Wash Lea home just up the cove from the Qualls farm. Sometime before their second daughter, Carolyn, was born, they built a red brick siding home not too far from the residence of Gentry’s parents. Gentry supported his family by farming, and to supplement his income, he worked in the winter months for Bill and Elma Lee Bussell in their grocery store on the square in Livingston. On Saturdays, he came home at 4:00 to do the milking, and then went back to work at the grocery store until 10:00 p.m., the time all the stores around the square closed on Saturday nights. Both Gail and Carolyn would often go back to the store with their dad on Saturday nights. That was always the day of the week everyone came to town not only to shop, but to visit with friends and acquaintances. Coming to town on Saturdays was a wonderful source of entertainment then. Life for Gentry, Talmadge, and daughters always centered around the family and their church. Over the years, they have all been life long members of First Baptist of Livingston. When the church was located not far from the courthouse square, it was nothing for revivals that lasted two weeks to be held there. It was always just taken for granted that the whole family would be there most anytime the doors were open. During the time Gail and Carolyn were growing up, their parents did not have a television, but their Pa and Granny Qualls (Luther and Eura) did. The girls remember quite well the night Elvis Presley was scheduled to appear on the Ed Sullivan Show. Everyone was talking about that special event, but there was just one problem. The Ed Sullivan Show was on Sunday nights, and the Qualls family never missed a church service unless someone was really sick. Even though Gail and Carolyn knew what their parents would probably say, they begged them to let them stay at Pa and Granny Qualls’ house that night to watch Elvis perform. After a long discussion, their parents ended up giving them permission to stay home to watch Elvis. Neither daughter has ever forgotten that night, and not just because they got to see Elvis’ first appearance on television, but the fact that their parents, who believed church always came first, gave in this one time. For those who might not know about how strict regulations for television broadcasting were then, Elvis was shown only from the waist up in order not to be offensive or to make a bad impression on any younger children who might be watching. My, my, how things have changed!! Some of Gail and Carolyn’s happiest memories are of the many times they walked up the path to Granny and Pa Qualls’ house to spend time with them. The story of how their Granny and Pa Qualls moved from Dry Hollow to the farm where both Carolyn and Gail still live on is one of their favorites. It was in the fall of the year when they began their journey with two wagons loaded down with their household possessions. Gentry was around 4 years old when they moved. Bringing all their furniture and household belongings by wagon wasn’t all that difficult, but that isn’t all that they brought along when they moved. All their livestock that included both cattle and hogs were driven from the farm in Dry Hollow. But that’s isn’t the best part. Granny Qualls also drove a flock of turkeys to their new home. The trip was a long one from Dry Hollow to the Qualls farm outside of Livingston. In fact, they spent the night at the Oakley farm in Hartsoe Cove. Arrangements had been made ahead of time with the family who lived in the house there. The cattle and hogs, along with the turkeys, were put up for the night just as all the members of the Qualls family were. Both Gail and Carolyn describe their Qualls’ grandparents as being fun loving people who were very enjoyable to be around. They always made a big garden every year. They milked Jersey cows and had many customers around Livingston who bought their butter and eggs on a regular basis. Luther Qualls never learned to drive and didn’t use a tractor to farm with. He depended on his mules, Kit and Dinah (pronounced Diner). He was even reluctant to learn how to use a garden tiller, but once he did, he decided he liked it very much. One of the things he checked on regularly was the fences around his property. He always kept the fence rows neat and clean and walked all the around the property lines to be sure everything was as he thought it should be. Many times he returned with a really big rattlesnake he had killed while walking the property line on the mountain behind his home. Just before the end of World War II, Gentry ordered a new John Deere tractor from Patterson and Roberts Hardware store on the square in Livingston. Because the war was going on, the order was put on hold and wasn’t delivered until after the war was over. Carolyn’s family still has that tractor in a shed on their farm. Gentry worked many years of his life with the Farmers Coop here in Livingston where he served as manager until his retirement in 1974. The Christmas holidays were described as simple ones at the Qualls home, but always very enjoyable. The Christmas play at First Baptist Church was usually the beginning of the holiday season. Each child and even some of the adults always had parts to be memorized for the play. A large cedar tree was placed in front of the baptismal pool and everyone took part in decorating it with mostly handmade decorations the children had done in Sunday School. The play would be presented on a Sunday night before Christmas, and then after gifts were exchanged, everyone who attended got a little brown paper bag with fruit and candy as they left church. Everyone in all the Sunday School classes drew names every year for Christmas. Carolyn remembered one year the person who drew her name didn’t come to the Christmas program and she didn’t get a gift that year. The next year, several family members put a gift for her under the tree at church to make up for the Christmas she was left out. Unlike today’s traditions that mark the beginning of the holidays as early as Halloween, Christmas at the Qualls house didn’t begin until just a few days before December 25th. A cedar tree from the farm would be brought to the house and decorated, and then on Christmas eve, Gentry always read the second chapter of Luke to the family, and Talmadge would read "The Night Before Christmas." Breakfast on Sunday morning would be creamed eggs over toast. Talmadge always made a special fruit punch for Christmas too. Her recipe called for all kinds of fruit, including things like fresh pineapple that was not ordinarily used any other time of the year. Something Luther Qualls usually did around Thanksgiving or the Christmas holidays was to kill hogs. The time to get this job done was always dictated by the weather. If it wasn’t cold enough around Thanksgiving, it was put off to closer to Christmas. Sometimes it ended up being too close to Christmas to suit Talmadge, but everyone in the family pitched in, and somehow they managed to get that task done just in time to begin cooking for the Christmas holidays. 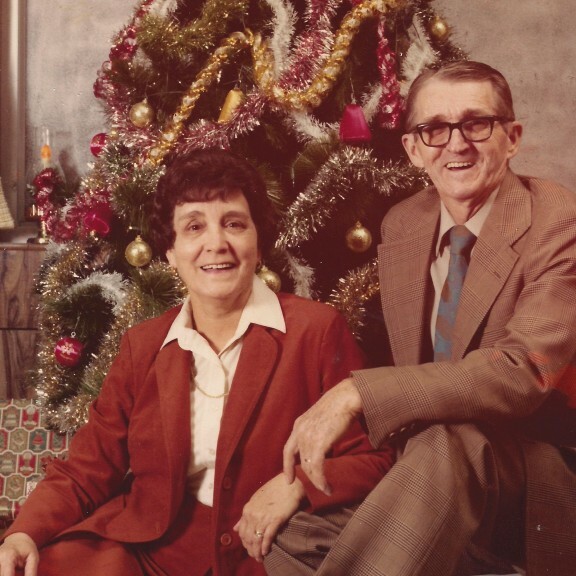 On Christmas Day, the family all gathered at Pa and Granny Qualls’ home to eat, and since most of the family members had cows to milk , everyone left in the afternoon in time to get the milking done. It was always around that time Gail would begin to cry because the holiday that seemed to take so long to arrive was officially over for another year and she didn’t want it to end. 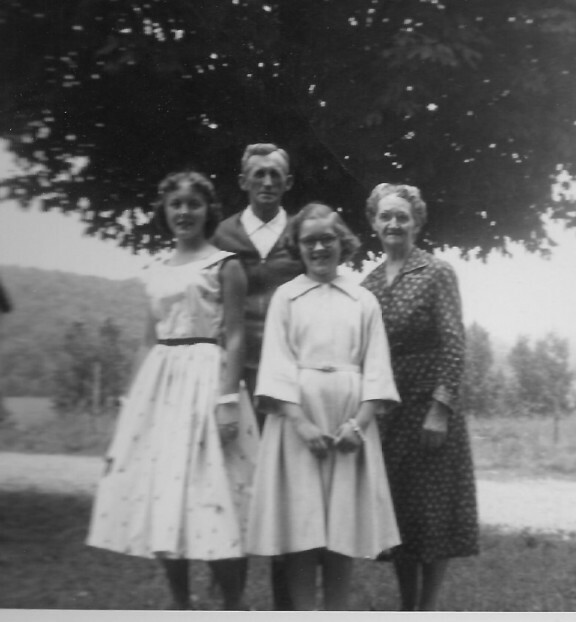 Visiting the Hugh Carmack family was something else both Gail and Carolyn always enjoyed very much. That family lived on the other side of the road and across the field from the Qualls house. There was a large number of the Carmack children, and are remembered as always being a lot of fun to be around. Some other families the Qualls’ considered some really good people to live by were nearby neighbors Lee and Myrtle McCormick, Frank and Eva Linder, and Otley and Ethel Smith. In April of 1965, Talmadge and Gentry moved into a new brick home they had constructed not far from the smaller red brick siding home they had lived in for a good many years. Gentry continued to work at the Coop, and in 1974, decided it was time to retire. It was in August of 1983 that he passed away. By this time, Carolyn and her family lived in the home where her grandparents, Luther and Eura Qualls, had lived. After Gentry passed away, Talmadge lived on in their home until a fateful day in March of 1996. She and Carolyn had been gone for the day, and as they neared Livingston on the return trip back home, Talmadge commented that the sky had a strange appearance. Not long after she made that statement, large clumps of hail began to fall and all sorts of objects were blowing in the wind. They didn’t realize then, but a deadly tornado was bearing down on the town of Livingston. As the sky grew darker, they pulled off the highway for a few minutes, and then made their way toward home. But as they got closer and as the sky begin to lighten, a terrible sight lay ahead. Other than one wall that had a telephone on it, about the only thing that remained of Talmadge’s home and belongings was a gold fish that was sitting in its bowl in the driveway of her home. The goldfish belonged to Talmadge’s great-grandson, Nick. Amazingly, the gold fish lived for a few years after surviving the tornado. Although Carolyn’s home seemed to be in tact, it had in fact been lifted off its foundation. The farm suffered extensive damage from the storm with outbuildings being blow away, trees uprooted, and fences blown away. Those members of Carolyn’s family who were home rode out the storm in the bathtub of their house. Several weeks later, Carolyn got a call from Willie Hugh Bilbrey who worked out of the central office of the Overton County Board of Education at that time. A letter had been received at the Board of Education from a man who lived in Bell County, Kentucky, an area near the Virginia line. This man had been out squirrel hunting and found a report card that belonged to either Gail or Carolyn. It was damaged, but enough information was visible to be able to see that it came from the Overton County school system, so he mailed it to the Board of Education office. The powerful winds of that tornado carried it hundreds of miles away on the day of that terrible storm. After the death of Gail’s husband, Charles Walker, she moved back to the Qualls farm, and in 2005, built her house very close to the location where her parents’ home stood before it was destroyed in the tornado. 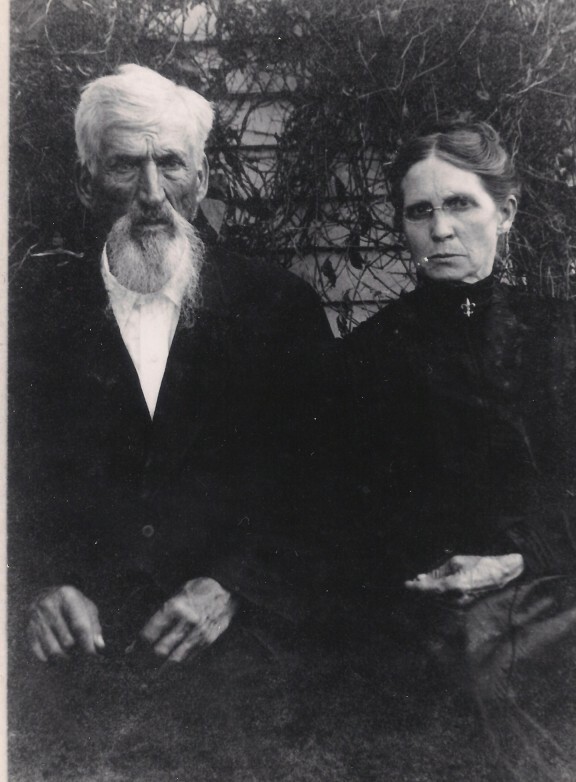 Prior to moving back to Livingston, she and Charles had made their home in Sparta for 48 years. Carolyn and husband, Kuell White, ended up having the old original Qualls home torn down because of the damage done in the storm. They rebuilt on the same location and included space for Talmadge to have her own separate part of their house. She died on November 19, 2000, at the age of 84 years. I have known both Talmadge and Gentry Qualls most of my life. Talmadge and my mother were good friends, and I can honestly say I don’t know any kinder, more loving and caring folks than they both were. They lived a life that reflected their strong beliefs that were deeply rooted in their Christian faith, and everyone loved and appreciated them for the honest, dependable, and sincere people they were. Talmadge definitely had a gift for writing and has recorded many of her memories of her childhood days in Wilder. The Overton County Heritage Museum has copies of her writings titled "Life At Wilder." Proceeds go to the museum. Several years before her death, Talmadge was also interviewed by Cookeville’s public television station for a documentary on Wilder and the coal mines there. Along with the sweet personality she had, the soft way she had of speaking captivated the audience, making viewers want to sit for hours just listening to her voice and the details of her life. Although I’ve only skimmed the surface as far as sharing some information about both Talmadge and Gentry’s lives, I’m very happy to have had the opportunity to share just the bits and pieces contained in this story.